Get sheets of ornate vintage labels at Worldlabel.com. Choose a design and download the PDF, then open it and type in your information. Super for people like moi with bad handwriting. Designs are sized to print on standard label papers. Thanks for the links - lovely! I LOVE those. I've started making fancy looking mailing labels when I need to ship things. These will be used. This is perfection. Thank you so much! I so appreciate all your downloads... do you know how cool that is - it keeps me coming back for more! "orange-U-the-best" ~ I think so!! such a good find! thank you. oh thanks soo much! 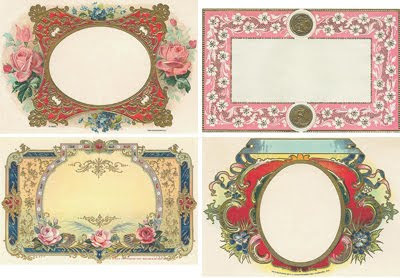 these are fantastic for some of my scrapbooking! and card making! love them! Lovely and thanks for sharing. Also, is this the same Suzie who passed away on April 21st of this year? She's on Flickr? If so, my condolences. great!!!! That i could really use! so pretty and perfect, i love! Thanks for sharing! I can't wait to use them. Hi Debbie, since notecards are all different sizes, I'm not sure what exactly you're looking for. Since the files aren't set up as folding cards, but rather sheets of labels, they don't have a second panel for writing. If that's what you're after, you could print out a sheet of labels and then cut out each label, gluing it onto a folding card. You can print at a different percent scale to get the size you need. Or, I'm not sure if you can crop a PDF in Adobe Reader; you can find out. I know you can do it in Adobe Professional. You could crop the PDF down to a single label and print it on a sheet of paper, leaving enough room to one side of it for the folded portion of the card. Then cut out the notecard and fold.